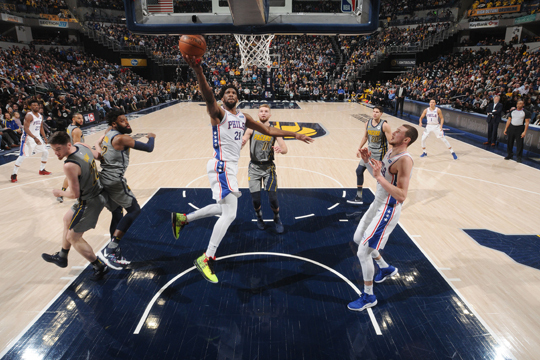 Los Angeles, United States—Joel Embiid played through the pain of a sore back to finish with 22 points, 13 rebounds and eight assists as the Philadelphia 76ers beat the Indiana Pacers 120-96 at Bankers Life Fieldhouse in Indianapolis, Indiana. Elsewhere, Pascal Siakam banked in the winning shot at the final buzzer as the Toronto Raptors won their eighth consecutive home game with a 111-109 victory over the Phoenix Suns. Siakam’s basket, which was upheld by a video review, bounced off the backboard and went in after Suns’ Mikal Bridges had tied it 109-109 with 13 seconds to go. “To be honest I didn’t know what I was going to do. I just wanted to take the last shot, whatever shot that was,” Siakam said. Phoenix’s Devin Booker scored 30 points, Deandre Ayton had 15 points and 17 rebounds, and Kelly Oubre scored 18 in the loss as the Raptors swept a back-to-back season series against the Suns for the first time.